PANAMA CITY BEACH, FL, May 4/Via CMG MEDIA – Major corporate sponsors once again saw Spring Break in Panama City Beach, Florida as an opportunity to connect their brands with college students. Large companies such as Pepsi and Coca Cola were very active, both on the beach and on hotel properties, offering an amount of freebies that ranged in the hundreds of thousands. 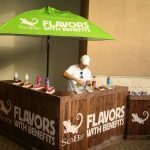 Activations included showcasing concert-style stage set-ups, comfortable beach lounges, and of course, plenty of music, while hotel pool decks were also decked out with stages, DJ music, and branded booth set-ups. Student marketing firm Collegiate Marketing Group (CMG) managed and partnered with multiple activations and event programs during Spring Break including a large SOBE promotion, the Coca Cola Spring Break Magazine, Friendthem smartphone application, Wal-Mart, an on-sight Social Media Command Center for students, and a Guinness World Record event! CMG has become a North American leader in the student marketing space both digitally and through targeted events such as Spring Break. To learn more about CMG, please visit their website at www.cmgmediaagency.com.